The apartment is in an outstanding location, one block in (about a 5 minute walk) from Circular Quay. The city is installing light rail on George Street, so it was rather noisy outside most of the time we were there. But, we didn't hear much of the noise while in the apartment. The apartment is pretty well equipped for self-catering but, because it's small and dark (with window looking out to a ventilation shaft), it's not a place to hang out. Good thing there's so much to keep you out-of-doors in Sydney. The property manager was excellent and arranged to drop the keys to my workplace and that was greatly appreciated. 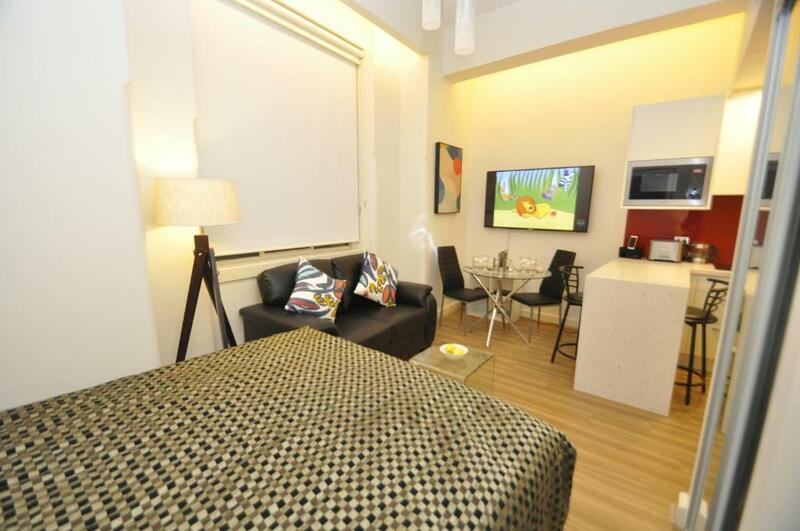 Well appointed studio apartment, tasteful kitchen setup and the bed was very comfortable. Bathroom excellent, great water pressure! le lit, la proximité de l'opéra et des commerces, et la possibilité de laver et sécher ses vêtements sois même. Located 1,300 feet from Circular Quay, Sydney CBD Studio Apartment 503BRG offers accommodations in Sydney. There is a dining area and a kitchenette equipped with dishwasher. Overseas Passenger Terminal is 1,950 feet from Sydney CBD Studio Apartment 503BRG, and Sydney Opera House is 0.6 miles from the property. The nearest airport is Kingsford Smith Airport, 6 miles from the property. When would you like to stay at Sydney CBD Studio Apartment 503BRG? This well-appointed studio apartment comes fully furnished and supplied with with towels and linen. It contains everything you will need for both a short-term or long-term stay. House Rules Sydney CBD Studio Apartment 503BRG takes special requests – add in the next step! Sydney CBD Studio Apartment 503BRG accepts these cards and reserves the right to temporarily hold an amount prior to arrival. Rollaway beds, travel cots and high chairs can be requested for an additional charge, and are subject to availability. Please ensure you leave all keys and remotes inside the property on departure. You must show a valid photo ID and credit card upon check in. These must be in the same name as the guest's name on the booking confirmation. Please inform Sydney CBD Studio Apartment 503BRG of your expected arrival time in advance. You can use the Special Requests box when booking, or contact the property directly using the contact details in your confirmation. Window looked out to a brick wall. Bed was terrible with the cheapest pillows. The noisiest place I’ve ever stayed. Constant building works. The smell of cafe/restaurant foods stunk the room out of window was open. Check in was terrible. I had to go to Pyrmont to collect keys as I arrived late and then was given the wrong details that locate the key and no one answered the phone. It was pure luck that I found the key after trying random boxes to see if the code worked. Also no hairdryer. Window looked out onto a brick wall with very little natural light and no natural ventilation.Bedspread was dirty. Note behind front door stated that if we used more than our quota of electricity we would be charged extra.Charged 100$ for cleaning. Location was good. Air con worked thankfully. 1. The $195 cleaning fee (for a 20 min clean) and $99 Destination fee (whatever that is) was not obvious on the initial quote, so cost $294 more than expected. Key pick up was very inconvenient - a $30 taxi ride to and from. Bed was on rollers that could not be locked - were therefore unable to sit up in bed. Room very small - the only place to put suitcases was on the couch which made the couch unusable. View out window of brick wall opposite. Water for showers ran out after ten minutes. Were not given WIFI code on arrival nor told how to access pool. Bed uncomfortable and pillows paper thin. Sign on back of door telling us we had been allocated power and water and any extra will be charged. This was not mentioned upon arrival nor at time of booking. Apartment dirty uppn arrival. No views. There were 2 cockroaches in the bathroom during my stay, they probably sneak in through the pipe ?? The only thing that made the stay a little uncomfortable was the construction project happening right out front. Very noisy machinery and drilling until at least midnight. But understand this is a timing concern and next visit I would expect this activity would be completed. This was the worst property we've ever booked on Booking.com. This property is poorly managed. Sydney closes down for 4 days over Easter weekend. We arrived late Thursday, so it took 4 days before we heard from anyone about issues/concerns. The bedding, drawers and many surfaces were filthy. The management did get us a clean blanket and extra towels and had a plumber look at the flooding shower on day 5 of our stay. The apartment is dark. There is no hairdryer, but we knew that beforehand. We had to go to a remote location to pick up a key, and found no helpful welcome/orientation info in the apartment. Internet was useless.